Weber's One-Touch Gold kettle grill is a great buy for anyone looking for a classic model with a few convenient extras. The design is sleek. The results are delicious. As with all Weber grills, this kettle's lid and bowl are constructed of premium porcelain-enameled steel--which means not only does heat radiate evenly, but the grill will survive if it's left out in the rain. The cooking surface (22-1/2 inches in diameter) is big enough to accommodate six large steaks, twice as many burgers, or up to a dozen kebabs, and the grill's classic kettle shape keeps flare-ups to a minimum. When designing this grill, Weber clearly kept convenience in mind. 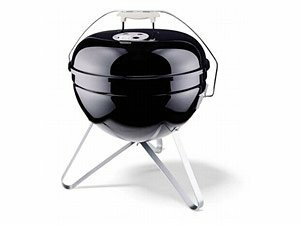 The grill's nickel-plated grate has two built-in hinged side openings that make adding more charcoal briquettes easy and safe, and, when the lid's not in use, it can hang from the bowl by a handy hook. The grill is durable, too. The porcelain-coated steel bowl and lid are exceptionally strong and designed never to rust, fade, or peel. The grill's aluminum vents and ash catcher won't rust either, and its tripod base, nylon handles, and all-weather wheels--besides being exceptionally sturdy--make the grill remarkably easy to maneuver. Weber's patented One-Touch cleaning system--a clever setup of lever-activated blades--sifts ash out of the kettle and into a cooking-pot-shaped ash catcher. You never have to get your hands dirty--and emptying the kettle takes only a few seconds. To top it all off, Weber throws in a 31-page owner's guide filled with cooking tips and time-tested recipes for grilling everything from pork chops to bratwurst to Cornish hens. You're probalby thinking that there's no reason to update the 10-year-old Weber you've got in your back yard. Well, turns out Weber has made some smart improvements over the years-- the new "gold" model is worth the upgrade. The ash-catcher is super, the one-touch vent system is a big improvement (no more knocking each vent with a trowel), the plastic handles stay cooler... you get the idea. Nothing dramatic, but good progress. But here's the clincher: setting one of these up (takes about 20 minutes, even if you make a mistake or two) just makes you feel like you're in heaven. It's summer embodied. People rhapsodize about the new car small... well, fughettaboutit. The look of a shiny new grill that you've assembled yourself is about as good as it gets. Highly recommended accessory: the charcoal companion. Put your lighter fluid (or your MatchLight) away and use this instead-- it works flawlessly, and it's better for the environment. I'm a big Weber fan-- I've used a Genesis gas grill for six years and a Smoky Mountain Cooker for two. Recently purchased the Kettle Gold. Great charcoal grill! The enclosed ash catcher is particularily useful if you grill with lump charcoal versus briquettes, like I do. It catches any sparks and small pieces of lump that drop through the charcoal grate. Hinged grate is also a big plus. I like to use the Weber charcoal holders to hold my lump when grilling steaks-- push them together in the center to sear (brings charcoal about 2 inches from meat) then push them to the outer edge for indirect cooking. I also added a thermometer to the lid to check and adjust cooking temps. This baby would get five stars if Weber was still offering the cast iron grate upgrade for the kettles. It's been discontinued this year, but I hear some are still out there to be found. Even without cast iron, you can't go wrong with this as a charcoal grill, and being a Weber, it will last for years and you'll get great customer support if it is ever needed. 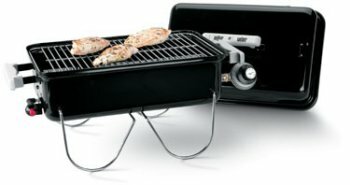 Before purchasing this grill, I was a die-hard gas guy. I figured that the convenience factor of quick starts, easy clean ups and not having to constantly buy charcoal would be a fair trade for the taste of good charcoal cooking. What this Weber grill provides though is super even heat, few flare-ups, awesome taste and super easy clean ups via the ash pan and a few kicks to the side to drop the ash through the vent holes...the best of both worlds! I still have my gas grill though (which will be used for the occasional hot dog), but for real cooking, nothing will replace my charcoal grill, except perhaps another charcoal grill. All I need now is the chimney starter to complete my set! I just got the Weber grill for my husband for Father's day and this grill is great. The food taste so good and he loves it. It's so easy to clean with the ash keeper on the bottom that I can actually get out of the kitchen and leave the cooking to him. (what a great bonus) I just ordered another one for my dad and I know he's gonna love it. When you have the time and crave that charcoal taste. I've used several cheaper water smokers, offset units, gas grills, you name it. I've used them all to make bar-b-que, however, non of them has produced a better product then the Weber Smokey Mountain. 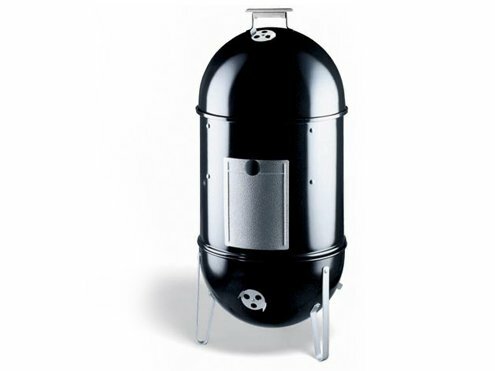 This is the best smoker you can buy at any price. It's perfect for small families and large ones. You can easily prepare 6 to 10 racks of ribs at once. I've done 3 - 7lbs pork butts and a 12 lbs brisket at the same time. This unit is made to Weber standard, so you know it's well built. Heavy enamel coating that will last a life-time. The effeciency of the cooker is unbelievable. I've done 15 hour cooks without adding any extra fuel. This is the first smoker (of any type) that I've used that I didn't have to baby sit. Most smokers need almost constant attention in order to maintain proper temp. Not the Weber. It needs virtually no adjustments to keep a steady smoking temperature for hours and hours. You can easily do overnight cooks and sleep easy as the Weber does it's magic. I purchased my Weber Smokey Mountain Cooker in August 2003 after talking about doing so for years and after looking at many competing models. I am not disappointed. From an engineering prespective it's design is simple and straightforward and it is extremely well built (just compare it to competing models and you will quickly see the difference). By reviewing the Thermometer installation procedures available at "virtualweberbullet" web site, adding an industrial grade thermometer by drilling a small hole in the cover was completed easily. The results have been fantastic!! I have used the noted web site to learn about techniques to extend the cooking period without having to add charcoal and the rib recipe (The Best Ribs in the Universe) is out of this world! Smoked Turkey, smoked chicken, smoked salmon and smoked almonds have all been easy to prepare and the results outstanding. I easily designed and constructed a side simple shelf (from two shelf brackets, a 10"x12" piece of oak, and a 1/8"x1" by 30" piece of steel straping available at Home Depot) that can be temporarily attached to the cooking section for use during any smoking session and easily removed so that you can then place the cover on the smoker for storage. You will not be disappointed with the results of you efforts with this smoker! The WSM (aka bullet) cooker is an excellent product for BBQ novice and master. Consistent temperature make this a great 1st smoker for anyone who wants to make their own real barbeque. Easy to clean, a joy to use. "Toolbits" hedgehog warmer is a comforting additon to anyone living out in the wilds where small, furry rodents come in from the cold, its easy to use, just a few flips of the switch and you will have a warm habitat for the furry creatures. The Weber One-Touch Silver kettle grill is perfect for anyone who wants a well-designed, no-nonsense grill that cooks up food deliciously. 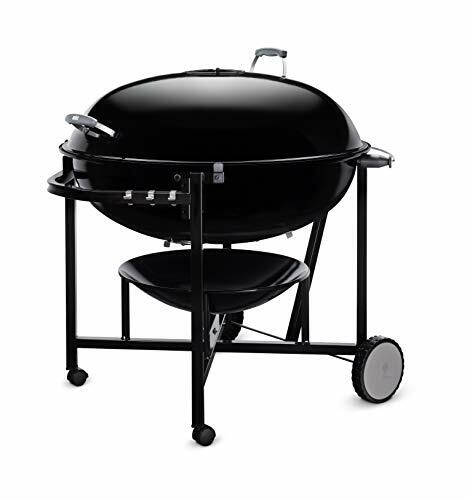 Perfect for backyard barbecues or just whipping up an evening meal, this impressive grill has a cooking surface (22-1/2 inches in diameter) big enough to accommodate six large steaks, twice as many burgers, or up to a dozen kebabs. And the One-Touch Silver's classic kettle shape radiates heat evenly and keeps charcoal flare-ups to a minimum. The barbecue pioneers at Weber--they've been making grills since 1951--know how to design a grill that lasts. The One-Touch Silver's porcelain-coated steel bowl and lid are exceptionally strong and designed never to rust, fade, or peel. The grill's hardware is of the highest quality. The aluminum vents and ash catcher won't rust, and the grill's tripod base, nylon handles, and all-weather wheels combine to make this Weber both exceptionally sturdy and easy to maneuver. Weber's patented One-Touch cleaning system--a clever setup of lever-activated blades--sifts ash out of the kettle and into the grill's removable catch pan. You never have to get your hands dirty--and emptying the kettle takes only a few seconds. We had heard this was the best grill on the market. We have a tiny terrace in a New York City apartment but love to barbecue so went for this which is really to large for the terrace but not for us, friends & family. It cooks great and we just tried the "indirect" cooking method. It looked like a pain to do it but turned out to be as simple as direct grilling, no fat dripping on the coals and with the Weber charcoal starter, easier than I've ever experienced. Altogether an A+++ experience. As far back I can remember my family has always had a Weber Grill. The first Weber I remember from when I was a kid, didn't have the one touch system. It was given away when I was 14, when my dad bought a Weber One-touch as it was called then. That was over 15 years ago. When I joined the military and got married I bought a Weber for myself. It was also one without the one-touch. We used it all the time. Then in 1998 I bought my dad the Master Touch for Father's Day. I wasn't too happy with the change from cedar handles to plastic. After it was put together we cooked a great meal on it. My dad gave me the one touch he bought way back when since he didn't have the need it. It's still going strong today cooking good meals everytime and still has many years to go even though it's kept out in the english weather. I have used other charcoal grills and gone to freinds and familes who used gas. The food defintly tastes different. I've got proof that they last too, sitting out side my patio door. I'm very happy with Weber's quality. If I decide it's time for a new Weber I would choose the Performer for the convinence. 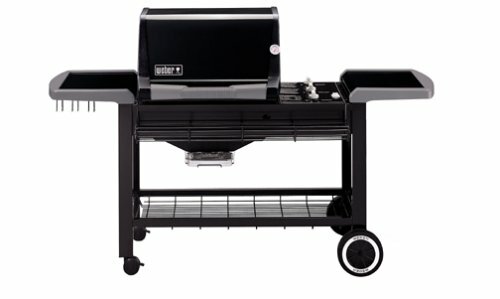 All the Grills that Weber makes are top quality and last. So buy a Weber and enjoy barbecueing like you never had before. My wife, kids, family and friends loved when I smoked a 25 pound turkey on my 22 1/2" grill. Mine is an older model with wooden handles. Recently (7/4/2004) cooked shish kabobs, WOW! This grill, as John Cameron Swayze said on old Timex watch commercials, takes a licking and keeps on ticking. Now if Weber only offered a refinishing kit/service for these; mine is 15 years old, has been out in all weather uncovered. Why buy anything else? Well, as one reviewer pointed out, the Sunbeam is cheaper and cleans out more easily--but who cares? It's not as well built and thus will not last nearly as long. A key feature that many Americans (unlike hardwood burning southerners and grapevine burning mediterranean folks) realize is that one can actually cook food over coals obtained from burning real wood (yet we, continually hoodwinked marketing victims, spend billions on bags of charcoal a year). 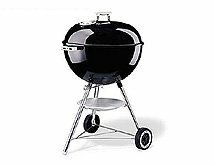 Such common sense purists in the know view charcoal as rediculously as charcoal enthusiasts view gas grills. With a heavy duty, basic-design Weber a nice pre-party hardwood fire can crackle away until beautiful and far more flavorful and longer lasting coals are obtained. Remember those 12 acres of kindling lying on the ground behind your house or along the road where you walk your dog? All for free--and didn't it need to be burned anyway? On most other grills, such roaring fires wood detroy the enamel, melting an entire cooking unit down to a point where an 8 by 6 foot black hole could be left in one's smoldering deck. No fears from the big weber--just keep the kids back as well as heavy alcohol consumption down until cooking is well under control. Don't be throwing in those toxic pressure-treated off-cuts to celebrate your new deck either. Also, to keep the fire rolling without stoking up more flames, one can add storebought charcoal if necessary, which is a small concession to keeping the party rolling. The advertisement picture shows the cover below the top of the wheels. The cover I received was a full 3 inches above the top of the wheels and left the bottom storage rack fully exposed to the weather. I saw this product oin the store yesterday, and I think it'll be great. Do youselves a favour and buy it somewhere else though. Amazon says it "usually ships in 24 hours". Now, 48 hours later, only ONE of the items (the smallest one that I just threw in for convenience) has shipped. Of course, this means that I can't cancel my order and buy it at the store now. Amazon's customer service has slipped significantly in the last 2 years. Save yourself the trouble and buy from a local retailer. This cover fits cleanly over the shape of the Weber grill. It protects the finish, grill, and related parts from the elements while still allowing you to move the product around with the wheels. The cover has lasted for 3 winters on my deck, through ice, snow, sleet, hail, rain, and hot baking sun. It's a great cover for a great grill. 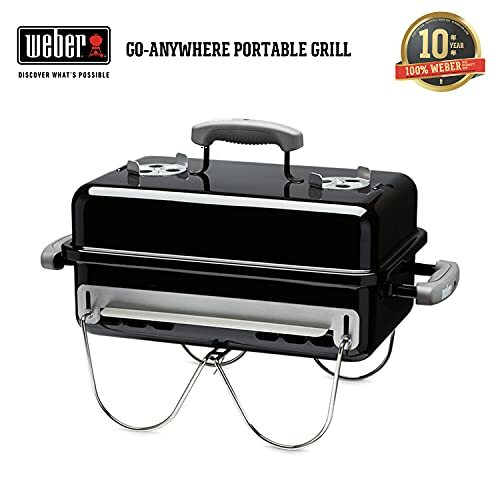 Weber's Go-Anywhere gas grill adds convenience to the fun of camping and tailgating. 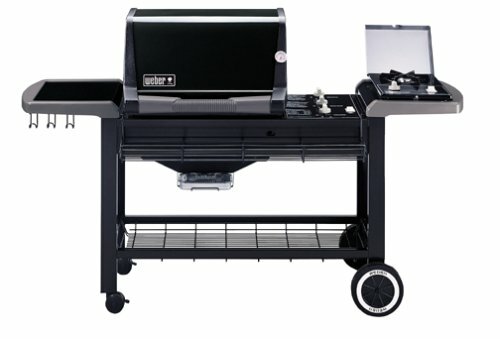 This compact unit has a surprisingly generous grilling area--large enough to fit four medium steaks. The push-button ignition system makes lighting the fire easier than ever, and the patented heat-distributing Flavorizer bar ensures that your food cooks evenly and efficiently every time. I've owned a Weber Go-Anywhere for a couple of years now and it's been a regular part of my outdoor cooking. Gets up to temperature quickly and is great for grilling simple stuff like salmon, chicken and sausages. The food doesn't taste *quite* as good as my mesquite-fired kettle BBQ but the Go-Anywhere also doesn't take 30 minutes to fire up. The piezzo lighter flaked out on my Weber a couple of months after I bought it but it's pretty easy to light with a match. As another review mentioned, they do rust pretty quickly but they're really sturdy and basic. It grills as well as it did when I first bought it. Strongly recommended for folks looking for a small, no-nonsense (or frills) gas BBQ. This Webber gas grill is a joy to use. It is easily portable (perfect for tailgating, picnics ...) and simple to use. You can buy the propane tanks in any department store ...I have found that one propane can... is enough for at least 3 grill times (for 2 people). The food itself cooks well and has a nice flavoring. Dogs, burgers and ribs have all come out very well using this grill. There is enough surface area to feed about 3 adults on average. My only complaint would be that the gas starter button is a little flimsy; you need to be careful when starting it. But this is a great product and I love using it. There just isn't a better portable grill anywhere. I remember in college my roomie had this old gas hibachi purchased at WalMart for about $25. It was all we could use at the apartment, so it had to be small. It cooked unevenly, never got super hot, but got us through two years of school. Fast forward nine years later, where $50 doesn't seem like a huge sum of cash anymore. Based on some reviews here, I ordered it up. I have cooked ten meals on it - pork, chicken, burgers, fish tonight. It cooks better than ANY grill I have used before, full-size or not. It gets pretty hot, for one. The drip pan over the pro-style burner tube vaporizes all of the fallen juices, smoking things up real good and giving food a great flavor. You just have to let it crank for 10 minutes on high to get up to temp, then adjust the temp to your liking. You can tell out of the box the difference Weber makes in grill making. It is heavier than you would think. The burner tube is a full length unit, covering the enetire cooking area. The regulator is even better than on the portable grills you find at K Mart. The drip pan replaces those terrible, smoky, greasy lava rocks. The ignitor is a nice touch. Some keys to good grilling though - always, always keep the lid on. Don't poke your food - lets all the juices out! Only cons to this unit -- the disposable propane tanks get expensive, and this grill goes through them pretty quickly (if you use the grill every day, of course). And lastly, the right side of the unit cooks ever so slightly cooler then the rest of the unit (good for veggies, etc). I bought this grill specifically for tailgating at PetCo Park when my beloved Milwaukee Brewers came to town. Since PetCo doesn't allow charcoal grills, I had to settle for cooking my brats over gas. I was able to cook four brats, two ears of corn and some beer soaked onions in tin foil all at the same time with this grill. There was even a breeze that day, and it didn't blow the flame out. The only small complaint is the starter didn't work too well - luckily, I brought a pack of matches along just in case. Otherwise, this grill worked just fine! I bought this nifty little grill for tailgaiting and to use on the cramped deck of my apartment in the city. For those purposes, it's great -- it folds up into a secure, compact little unit that goes anywhere without a fuss. It's also well constructed and has held together through several years of rough use. Be aware though that it's definitely not a good choice if you're doing a lot of grilling in one place -- it never quite gets hot enough to work well as a primary grill, even if you leave the cover on and let it preheat before adding your meat. Any wind at all strips the heat right out of it, even with the lid on. Make sure you stock up on the little gas cylinders or get the tank adapter -- nothing worse than running out of fuel in the middle of a batch of food. First of all, despite some comments here that would lead you to believe otherwise, this is NOT a gas grill. The dead giveaway is the word "charcoal" in the product title. Even though this is designed to be a travel grill (with folding legs that secure the cover in place), I use it as my primary grill. I like to grill at all times of the year so I leave it on the patio all year round and sometimes have to dig through a snowdrift to find it. I'm surprised it hasn't rusted out yet since it has been sitting outside for more than five years. The wood parts are weathered, but still no sign of metal corrosion. When this one eventually goes I'll probably get small round Weber since I really don't need the travel feature. It does the job, but as one reviewer said, it doesn't get very, very hot. Hot enough to cook meat well - yes, but the hamburgers don't have a terrific taste, just an average + ordinary taste. This would all be fine if I only paid $24.99 for it, but I paid $49.99. It is well made of good materials, but honestly, I don't see where it's much different from what they're selling at Wal-Mart for thirtysomething dollars or less. I had a similarly designed Sunbeam charcoal tabletop that rusted out after 15 years. I had given up on finding a replacement until I saw this gem on amazon. 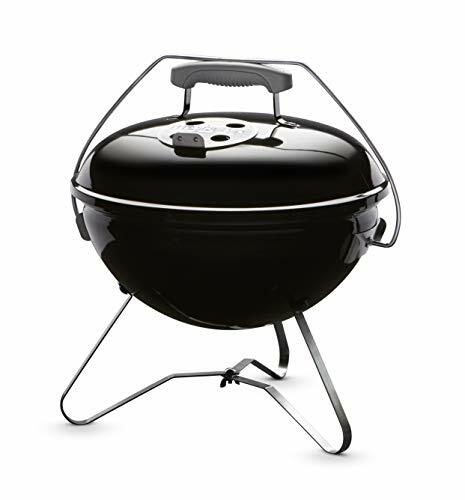 It has the same compact design as the Sunbeam, a stable base, wind resistant grilling, AND THE QUALITY OF A WEBER!!!! 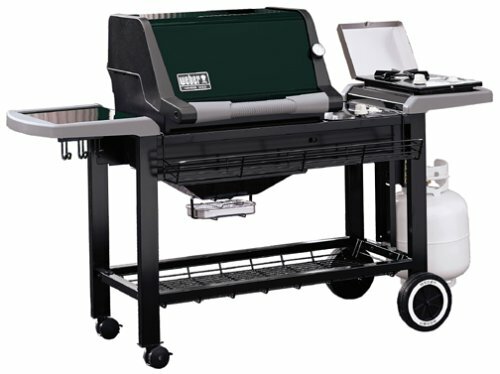 The best feature is the folding legs that lock the contents inside the grill and allow easy portability. I know this one will last longer than the pressed metal of the old one. Thank you. This is the third little Weber I've had in the past 20 years - I've never worn one out; the first two were stolen! I like the locking handle on the new model. One great feature of these grills is that when you are done cooking, you can close all the vents and the fire will go out in about 15-20 minutes, saving whatever's left of your charcoal for the next time. With the handle locked, it won't spill in the back of your pickup on the way home. It really does do a great job of cooking, as good as the larger Webers, just for a smaller crowd. We had a Mulberry tree trimmed in our yard and I saved all the chipped up wood to use for smoke flavoring. You still need a charcoal fire for heat; just throw in a handful of chips before you put the meat & corn on the cob in and close the top vent down to make it smoke. Mmmmm, Mmmmm! we've used the smokey joe for 10-12 years,had to replace the original 2 years ago. we gave each of our three children one for xmas.you won't find a better grill for steaks, burgers or dogs and we also use it for a slab of ribs occasionly. it vents well,which means you can control how your meat is cooked. the gold smokey is built even better than the original smokey, we will get one as soon as our smokey wears out, maybe 9-10 years from now! don't be fooled by lookalikes, get the weber. We have owned a weber of some type for over 25 years, (charcoal that is). This Smokey Joe is the greatest. You can jusify firing up a small load of charcoal for just a few burgers or steaks with this one. Haul in the boat to the beach. Haul it in the car for a picnic. You won't be sorry you spent the $ on this even as a second grill to your big one. Great for "Cooking on the Road"
This is the perfect charcoal grill for taking on a trip. We recently took an RV trip with friends throughout Oregon/Idaho/Washington. This little grill was perfect for an end of the day BBQ of steaks, chicken, or ribs. The close up and lock handle is perfect for packing it back in the RV. The side and top vents are designed for keeping the coals going and the lack of bottom vents is a PLUS because the ashes stay in the grill, not in your RV storage compartment. This one exceeded my expectations and allowed us to cook in the outdoors. Thanks Weber! In '78 or'79 I bought a Weber "sloppy joe" coal burning barbeque. It's still a favorite of mine, but the name is worn off the handle, and some enamel is missing. Portable charcoal grills are great for taking the picnic on the road, but they can make it difficult to cook for more than two or three people at once. If you're looking for a mobile grill that allows you to sizzle enough burgers for the entire family without them having to eat in shifts, Weber's Smokey Joe Platinum charcoal grill may be just what your cookout needs. 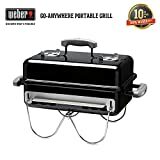 This handy grill is the big sibling of Weber's popular Smokey Joe Gold grill and sports an 18-1/2-inch cooking grate--large enough for a moderate feast. I purchased an original Smoky Joe back in 1984. With the exception of replacing the grate, it still looks brand new. My in-laws gave us a gas grill and after trying really hard to like it, we ended up back to charcoal in less than one season. I'm so impressed with the product, I bought a 2nd one to keep out at my hangar and planning on purchasing a Weber Performer for those times when size matters. You can't beat the product for durability and taste. Stop looking for a grill, buy this one. This is the best tabletop grill you can buy. Having an apartment where space is limited, I wanted a tabletop grill for small parties and the 18.5 inch grill was the perfect size. Also, it packs up neatly to transport on outdoor adventures. This grill will easily handle several burgers or kabobs at a time. It is so easy to use and the included guide makes it even easier with clear instructions and even a cookbook of simple recipes to try on your own. Get this grill. I've had a Jumbo Joe (now called Smokey Joe Platinum)for about 10 years. Its seen heavy use and its always been stored outside. It ought to be a basket case by now, but I have yet to replace any part of it, though the grates are rusty. In contrast with the previous review, I find the little Joes too small for two people. This model will easily handle a roaster and sides, plus it fits in my trunk with the lid upside down. I'd buy one again in a minute. This is an excellent grate. This is a must have for a charcoal grill. Terrific. When I am cooking ribs or a chicken which can take a few hours, you definately will have to add fresh charcoal. The beauty of this grate is that you can add more fuel without removing the grate which puts you at risk for losing you food on the floor. Simply lift up one corner of the grate and add prelit coals. For best results use the Weber Chimney starter to start your coals. I was in the hardware store today and I saw the regular Weber 22 inch kettle. How did I ever cook anything on that tiny little thing? This grill's huge cooking space gives you plenty of room for indirect cooking. It's impossible to sear steaks then move them off the heat in a small grill unless you're doing one or two. With this one, you've got acres of space -- my culinary success rate went way up with this one. I have a family of 7 with a few extra around a lot of the time. Grilling used to be a step by step process which usually meant I ate after everyone else because I was still cooking when most were eating. We like to do meat and vegetables on the grill and with this grill I can do it all at once and sit down with the family and enjoy! You can build your fire off center and spin the grate to move one item off and another item over the flame. You can also build small fires on two sides and put meat in the middle and smoke anything. Easy to control vents allow you to regulate the heat and burn time of the coals. Also it doesn't use a bag of cahrcoal at a time as you might think. You can use one Weber Chimney Starter (which I also recommend)full to cook most items. The grate is TOP quality. I used to go through a grate a year on my old Weber Kettle. This grate is beefy and I think must be finished better. No rust at all after two years. The only thing that keeps me from rating this 5 stars is dealing with ashes. You have to remove both grates (and the cooking grate is a handful)and shovel ashes out. The bottom has three vents that are not made for ash removal. At least you can cook a ton before ashes become a problem. It is expensive and a load but I would do it again in a heartbeat if a tornado came and blew it away. That is about the only thing I can think of that would keep this thing from lasting for 20 years or more. This is the title of Chris Schlesinger's new book. This book also has been an inspiration and recommedation for me to purchase this grill. I can cook anything on this baby. I have the room to do pizza perfectly and much easier. I have grilled 7 bone in Rib steaks on a multi level fire with delicious results using natural lump charcoal and a nice Oak log. Grilling just doesn't get any better. I don't have to worry anymore if I have enough room to grill for a large party. This is built to last. Your right Chris, I believe this grill has changed my life. I have used a 22" kettle for 18 years and have always wanted a kettle where I could use the inderect style of cooking with more accuracy. This kettle allows me to cook for one, two, or fifty,(people) with little problem. The setup for this grill is easy, and the first use was great. My neighbor looked over the fence, "Man, what a barbecue!" The hinged grate is sturdy, and allows easy access for adding wood to the fire. The lid works very well in the holder. The entire kettle is sound and the heat neaded to sear meat properly does not deform the grate (I keep a very hot fire). The price ... shipped is a very good value. By combining the convenient features of their Genesis series grills with the sleekness of durable stainless steel, Weber has created "the most refined gas grill ever built." The Summit 450 stands 60 inches tall, 67 inches wide, and 31 inches deep and features an input of 50,000 Btu's per hour. A brand-new burner system was designed for the Summit series: burner controls are on the front of the grill, which allows room for four burners, so all 424 square inches of the primary cooking area heat evenly and thoroughly. The Crossover Ignition System allows you to light all burners in succession with the push of one button. And the Summit 450's expanded total cooking surface of 493 square inches makes it easier to use various cooking styles: direct grilling for steaks and hamburgers or indirect cooking for roasting turkey or prime rib. The Summit 450 also has restaurant-grade enhancements, such as a commercial-grade thermometer and two heavy cooking grates made from large-diameter stainless-steel rods robot-welded for incredible strength. The hood, made of lustrous stainless steel, will never rust, peel, or fade, and its brushed stainless-steel handle stays as cool as it looks. Patented Flavorizer bars, made from heavy-gauge stainless steel, eliminate flare-ups and impart a rich flavor by turning meat juice into smoke. If you're serving ribs and salmon, you'll appreciate the Steam-N-Chips smoker that comes with this grill: it combines aromatic smoke from mesquite or hickory chips with steam to give your feasts a smokehouse flavor. Plus, you can cook veggies, create scrumptious side dishes, and reheat with Weber's 69-square-inch stainless-steel warming rack. Use the 12-foot quick-disconnect hose to get your first savory Summit cookouts started in a hurry--connecting your gas supply is, literally, a snap. Spiderproof screens were specially created to eliminate the frustrating problem of burner tubes clogged by cobwebs--Weber really did think of everything. The Summit 450 also has restaurant-grade enhancements, such as a commercial-grade thermometer and two heavy cooking grates made from large-diameter stainless-steel rods robot-welded for incredible strength. The hood, made of lustrous black porcelain-enamel, will never rust, peel, or fade because it's baked on at 1,600 degrees, and its brushed stainless-steel handle stays as cool as it looks. Patented Flavorizer bars, made from heavy-gauge stainless steel, eliminate flare-ups and impart a rich flavor by turning meat juice into smoke. If you're serving ribs and salmon, you'll appreciate the Steam-N-Chips smoker that comes with this grill: it combines aromatic smoke from mesquite or hickory chips with steam to give your feasts a smokehouse flavor. Plus, you can cook veggies, create scrumptious side dishes, and reheat with Weber's 69-square-inch stainless-steel warming rack. Use the 12-foot quick-disconnect hose to get your first savory Summit cookouts started in a hurry--connecting your gas supply is, literally, a snap. Spiderproof screens were specially created to eliminate the frustrating problem of burner tubes clogged by cobwebs--Weber really did think of everything. At first glance, Weber gas grills look like something that might be shot into space or driven in a Formula 1 race rather than the sleek cooking machines they really are. This is an understandable mistake, because with its Genesis series of grills Weber has made the time-honored tradition of outdoor cooking state-of-the-art, virtually putting an entire kitchen at your fingertips and on your patio. The Genesis Gold-B features a generous 611 square inches of total cooking area, which includes the primary cooking area, a warming rack, and a warm-up basket. Its three stainless-steel burners supply an input of 39,000 Btu's per hour and provide 550-degree broiling temperatures without wasting fuel. In place of the lava rock, pumice stone, or flat metal plates found in most common gas grills, Weber grills feature the company's patented porcelain-enameled Flavorizer bars, which do not retain dripped fats. Instead, juices sizzle and smoke when they hit the Flavorizers, eliminating potentially disastrous flare-ups and imparting a delectable smoky flavor to your feast. Getting the grill ready to cook that feast doesn't take long, either. Weber's Crossover Ignition System enables you to effortlessly start all three burners, which have been positioned to heat your food evenly. 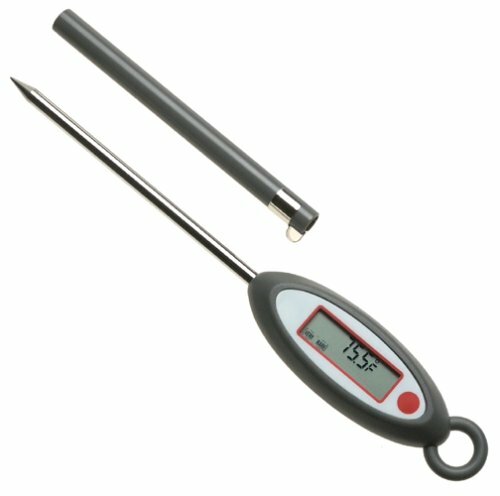 A dual-purpose thermometer included in the front of the grill unit measures the temperature under the hood; it can also be removed and used as a meat thermometer to ensure a thoroughly cooked meal every time. And you won't need to scramble for seasonings (or recipes--Weber provides a cookbook) or use a separate table while cooking, thanks to several convenient features. In addition to the two handy work surfaces on either side of the unit, a wire condiment basket hangs along the front of the grill, keeping condiments, spices, marinades, or other barbecue necessities close at hand. A wire shelf is situated beneath the grill and stretches the length of the unit, and three wire tool hooks hang below the work surface, ready for your spatula, meat fork, and basting brush. 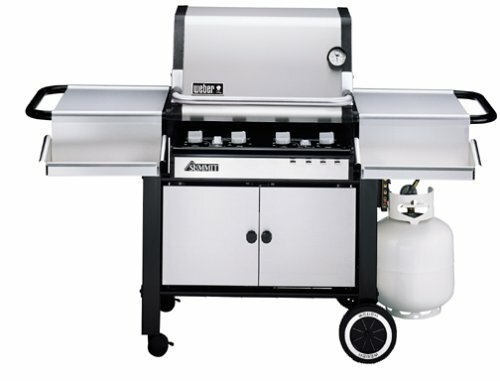 Weber's propane gas grills also come with a 20-pound LP tank and a precision fuel gauge. Thanks for all the input that I got from previous buyers. Weber makes a great grill and it ALWAYS fires up up on the first try! Getting the grill ready to cook that feast doesn't take long, either. Weber's Crossover Ignition System enables you to effortlessly start all three burners, which have been positioned to heat your food evenly. A dual-purpose thermometer included in the front of the grill unit measures the temperature under the hood; it can also be removed and used as a meat thermometer to ensure a thoroughly cooked meal every time. And you won't need to scramble for seasonings (or recipes--Weber provides a cookbook) or use a separate table while cooking, thanks to several convenient features. In addition to the two handy work surfaces on either side of the unit, a wire condiment basket hangs along the front of the grill, keeping condiments, spices, marinades, or other barbecue necessities close at hand. A wire shelf is situated beneath the grill and stretches the length of the unit, and three wire tool hooks hang below the work surface, ready for your spatula, meat fork, and basting brush. Weber natural gas grills also come with a 12-foot quick-disconnect hose. At first glance, Weber gas grills look like something that might be shot into space or driven in a Formula 1 race rather than the sleek cooking machines they really are. This is an understandable mistake, because with its Genesis series of grills Weber has made the time-honored tradition of outdoor cooking state-of-the-art, virtually putting an entire kitchen at your fingertips and on your patio. The Genesis Gold-C features a generous 611 square inches of total cooking area, which includes the primary cooking area, a warming rack, and a warm-up basket. Its three stainless-steel burners supply an input of 39,000 Btu's per hour and provide 550-degree broiling temperatures without wasting fuel. The Genesis Gold-C also features a side burner, rated at 10,000 Btu's per hour, that's perfect for creating a side dish to accompany your perfectly cooked main course. In place of the lava rock, pumice stone, or flat metal plates found in most common gas grills, Weber grills feature the company's patented porcelain-enameled Flavorizer bars, which do not retain dripped fats. Instead, juices sizzle and smoke when they hit the Flavorizers, eliminating potentially disastrous flare-ups and imparting a delectable smoky flavor to your feast. Getting the grill ready to cook that feast doesn't take long, either. Weber's Crossover Ignition System enables you to effortlessly start all three burners, which have been positioned to heat your food evenly. A dual-purpose thermometer included in the front of the grill unit measures the temperature under the hood; it can also be removed and used as a meat thermometer to ensure a thoroughly cooked meal every time. And you won't need to scramble for seasonings (or recipes--Weber provides a cookbook) or use a separate table while cooking, thanks to several convenient features. In addition to the handy work surface on one side of the unit, a wire condiment basket hangs along the front of the grill, keeping condiments, spices, marinades, or other barbecue necessities close at hand. A wire shelf is situated beneath the grill and stretches the length of the unit, and three wire tool hooks hang below the work surface, ready for your spatula, meat fork, and basting brush. 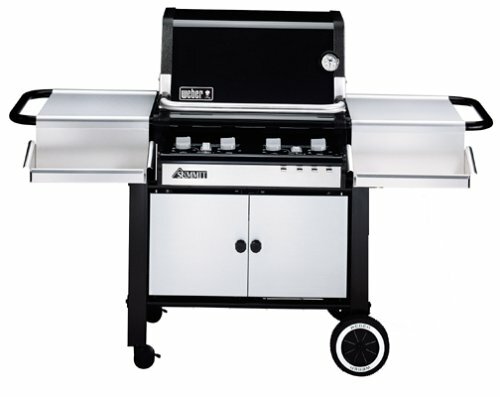 Weber natural gas grills also come with a 12-foot quick-disconnect hose. I bought a Weber Gold C Having upgraded from an ancient Silver B that I left at our old apartment when we moved. Not a big difference. Gold is a little bigger and a little hotter. I've never used the side burner. I've been grilling for years and have used many different machines. In terms of overall quality, longevity, even heat distribution,and simplicity, this series can't be beat. You may think they are a bit expensive, but you get what you pay for. Friends who have bought cheaper grills despite my warnings to the contrary have regretted their decision 1-2 years later and ultimately bought a Weber. Webers don't fall apart, and they can be left out in the rain. They don't catch fire. They're even relatively mobile. One small problem is the lack of "smoke flavor" you get with the flavorizer bars. It has an easy fix. I soak some Hickory or Cherry wood chunks in water and place them at the corners of the grill next to the flavorizer bars. Keep the top down and these smoke for the entire cooking process and make the food taste great. You can use this same method for slow roasting/smoking just by turning off the middle burner and leaving the sides on low. Toss a rubbed fresh pork shoulder on in the morning and by dinner time you have perfect smoked barbecue. I had my grill assembled by Lowes. They left off the utensil holders. I went back to Lowes but they denied any responsibility. I called Weber. A person answered the phone. Three days later I got the part in the mail. The only question they asked me was the model number. In fifteen or twenty years when this grill starts to show it's age, I'll be buying another Weber. Got it for my birthday! Recently, though, I've rekindled the interest in grilling and set out on the search for the ultimate grill. What I found was that I can't afford the ULTIMATE grill, but stubled across the Weber Genesis Silver C, which my wife bought me for my recent birthday! I've been able to use this grill several times so far, and have yet to ruin anything. The included 'Flavorizer' bars are angled to perfection to prevent flare-ups making it nearly impossible to burn your food. The 3 separate heat zones (burners) give plenty of flexibility and provide for a choice in cooking methods - Direct and Indirect - making it as simple to roast a turkey as it is to grill a burger or Brat!